Dragon Ball Heroes, the Data Carddass card game for which Bandai has sold more than 400 million cards in 6 years of operation, will have a sequel this fall. 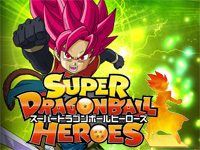 It will be called Super Dragon Ball Heroes. This new version will have a 32" screen (140% the size of the current machine), a touchscreen monitor to perform new actions and an improved gameplay. The player may use up to 7 cards at the same time (against 5 before). He may also create a "Hero Avatar card" to use his own avatar in the game. You can watch the trailer here. Code of Joker S is released today, it is an upgrade of Code of Joker that adds 2 new characters, 70 new cards and a new system called W-JOKER. The new characters are called Kiritani Murasakiame (voiced by SÅma SaitÅ), a scientist of the team of developers of the "ARCANA" cyberspace and Lina Valentine (voiced by M·A·O. ), an agent of the UK based "National Intelligence of the Defense Agency". Illustrations of the old characters have all been renewed. The new W-JOKER system increases the importance of the Joker skills. This version also introduces purple cards with powerful effects that use a special "purple" gauge. The opening of Code of Joker S is available here and the trailer here. 1cc Shirts T-shirt of the month is dedicated to Alpha Denshi Corporation. 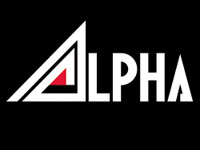 Founded in Ageo, Saitama prefecture in 1980, Alpha Denshi originally produced audio and telecommunications equipment. The company quickly started developing arcade games with Dora-chan for Craul Denshi (which would soon be removed from game centers for its illegal use of the Doraemon character) and a shogi game for Tehkan. They will then create many games during the 80s (Crush Roller, Talbot, Champion Base Ball, Exciting Soccer, Bull Fighter) catching attention of other companies like Sega, that would license some of their games to add to its catalog. In early 1987, Alpha Denshi is approached by SNK who's interested in their latest hardware developed for the game Kyros no Yakata. This PCB uses a Motorola 68000 16/32-bit processor while SNK still uses Z80 8-bit processors. SNK will handle the PCB manufacturing and develop more games on this hardware. As part of the agreement, SNK begin the distribution of Alpha Denshi games in America. This is the beginning of a close collaboration between the two companies that will lead to the creation of the NeoGeo system. Alpha Denshi releases several games on this platform (some of which are still famous today): Magician Lord, Blue's Journey, Ninja Combat, Thrash Rally, Crossed Sword, Ninja Commando and the World Heroes series of fighting games. Alpha Denshi Corporation changes its name in 1993 to become ADK and signs an exclusive contract with SNK, tying them to their platforms. As ADK, the company continues to release NeoGeo games such as Aggressors of Dark Combat, ShÅgi no Tatsujin, Over Top and Ninja Master's. ADK finishes its arcade career with the magnificent Twinkle Star Sprites competitive shooting game. It is to be noted that during its NeoGeo period, Alpha Denshi develops several titles that would never pass the prototype stage. One last game called Dance Rhythmix will be developed on NeoGeo. It will be seen at a location test in 2004, but will never be released, the company having fallen into bankruptcy in 2003. The intellectual property of ADK is directly acquired by SNK Playmore (today SNK) upon closure. SNK now includes some ADK characters in its productions from time to time. The proposed T-shirt is black coloured and features the Alpha logo with the "Alpha Denshi Co., Ltd." text in Japanese and English languages. It is available until Sunday, May 29 at the regular price of $33.00 including shipping ($25.00 in North America). Order here. Gunslinger Stratos 3 is out in Japan today. This sequel has the same gameplay as Gunslinger Stratos 2 but adds new characters and stages. The three new characters come from the Odhner family: Argo (Tatsuhisa Suzuki), Kathy (Natsumi Hioka) and Ban (Yu Kobayashi). There is now a total of 26 characters, each one features 2 different designs: one from Frontier S and the other from the 17th Far East Imperial City Management District. 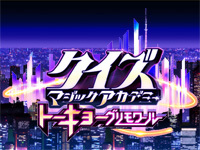 There are also 3 new stages: Shinjuku, Chinatown and Osaka Castle. 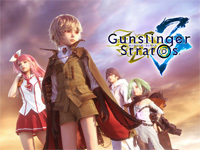 A campaign that will last until June 30 is launched for Gunslinger Stratos 3 release: when players buy a weapon pack, they will receive 30000 GP(in-game money) as a gift. Square Enix also organizes an event on May 14 at the Shinjuku Station Square where players can meet 3 of the game seiyus: Atsushi Abe (Tohru Kazasumi), Junichi Suwabe (Riccardo Martini) and Tatsuhisa Suzuki (Argo Odhner). The 150 first fans to arrive will receive a special NESiCA card. 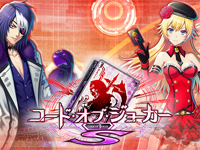 A special version of Gunslinger Stratos 3 will also be released in Round1 in the United States. You can watch the long version of the first trailer here and the second trailer here. Konami started the operation of Quiz Magic Academy Tokyo Grimoire since Wednesday. In this new version, the story takes place in modern Tokyo: character design has been revamped and all the characters wear contemporary costumes. There are 21 students and 11 teachers. The game title screen and interface are also renewed. The national online tournament specifications have also been changed. crossbeats REV. 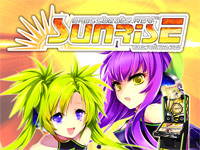 SUNRISE is out in Japan today. This new version of crossbeats REV. was announced by Capcom during the JAEPO in February. The new yellow theme will replace the black and purple colours of the original crossbeats REV. New characters are introduced: SUN, a girl with blond hair voiced by Sumire Uesaka and Kuronya, a cat wearing a yellow jacket voiced by Tomoe Tamiyasu. The player can either select one of them or the main character Akatsuki to assist them during the game. There are several new features as the "premium play function" allowing the player to restart a song from the beginning thanks to the Retry button. There are more than 140 songs including 30 new tracks ("LEVEL5 -judgelight-" - fripSide, "BURST THE GRAVITY" - ALTIMA, "God knows..." - Haruhi (Aya Hirano)). The players can now register their friends on the website with the Adobasari (opponent) function to easily find them in order to make score battles. A memorial campaign named "Every day one song free play" is held from April 28 to May 8. During this period, when the player plays crossbeats REV. SUNRISE with an Aime (or corresponding) card or electronic money via a mobile phone, he can play one free song every day. Aikatsu Stars! is out today. 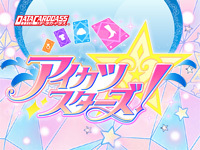 This is the second Data Carddass game in the Aikatsu! series from Bandai. Data Carddass games are collectible card games that use special cards with data stored on them. The player scans his card on the machine to interact with the game. In Aikatsu!, the player can scan cards featuring various clothes to make his character wear them. Once the character is dressed, the game consists of using the buttons to make the character dance in rhythm. A new character is added in this version: Yume Nijino. She wants to become a top idol and she enrolls in the Yotsusei Gakuen (Four Stars Academy). This academy has a special group called the S4, who are the top four active idols in the school. Yume and the other first-year students aim to become part of the S4. Aikatsu Stars! cabinet features an LCD touchscreen. Sega releases KanColle Arcade in Japan today! 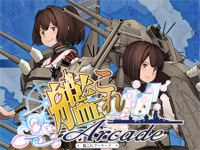 Developed by AM2, KanColle Arcade is an arcade adaptation of Kantai Collection (often shortened to KanColle), a collectible free to play card game for web browsers from Kadokawa Games. The game is only available in Japan but it enjoys an international reputation. The player plays the role of an admiral who runs a fleet of "kanmusu", boats and submarines of World War II personalised by girls. The appearance and personality of each girl is based on the ship that she represents. For example, a girl representing a boat with a large tonnage will have a big breast and a girl representing a submarine will wear a swimsuit. In KanColle Arcade, the player controls the direction and speed of his ship during the battles. Just like in the browser version, he can also collect different shipgirls. Kantai Collection was also adapted in mangas, books and an animated series of 2 seasons since January 2015. Sega doesn't waste time with its arcade version since Revision 1 of the game will be released on Thursday April 28th. This update will open access to the North waters and will add 9 shipgirls (video). 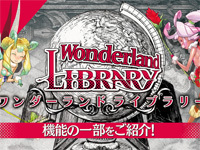 A new feature is available in Wonderland Wars since April 21: Wonderland LIBRARY. It's an additional terminal that allows players to playback and download any public play videos including rankings and tournaments. They can be downloaded to smartphones and USB memory cards. Players can install the Wonderland LIBRARY application on their Android and iOS smartphones. You can watch the trailer here. The famous statues manufacturer First 4 Figures launches a new line of statues based on Tekken characters today. 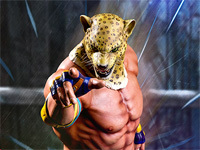 King is the first character to be released. 4 statues are available: King from Tekken 5 in regular and exclusive versions and King from Tekken 5 Dark Resurrection in regular and exclusive versions as well. In fact, it's masked King II who is represented here as he's the successor of King who was killed by Ogre. As all First 4 Figures works, King is made of high quality polystone, every detail has been captured perfectly (including whiskers on his mask and even beads of sweat on his body) and the statue is finished with a detailed hand-painted finish. The statue is at 1/4 scale and is 19" tall (22" for the exclusive version). The box also includes an art print of King inspired by the statue. The exclusive version stands on a special wrestling ring themed base, including the corner post and ropes. King comes in deluxe packaging with an authenticity card that allows you to register the statue online and to secure the same number for future statues in the Tekken line. The statue was sculpted by Vinai Mangalagiri and will be shipped during Q4 2016. The price is $374.99 for the regular versions and $439.99 for the exclusive ones. As usual, you can pay the total amount in 3 months. Pre-orders deadline should be scheduled to May 3rd, 2016.